Cauliflower has been beautiful lately, so I have been bringing it home with me. It has not always been a favorite of mine. There is something about the texture that reminds me of my old nemeses shoe-leather pork chops, my mother's salmon croquettes, and white turkey and chicken meat. I chew and I chew but they just will not disappear, leaving me with infinitesimally small particles that no amount of milk or water will wash away. But I like the flavor, something that it took a while for me to discover because I couldn't get past the texture. Over the years I have tried different methods to fix the texture problem, with varied success. The most successful technique, I have found (which is the case with almost all vegetables, by the way), is to roast them. Roasting must break down the cell walls in such a way that the moisture can then penetrate them. No science here and I don't know that I am right, this is just the best way I can come up with to describe my experience. 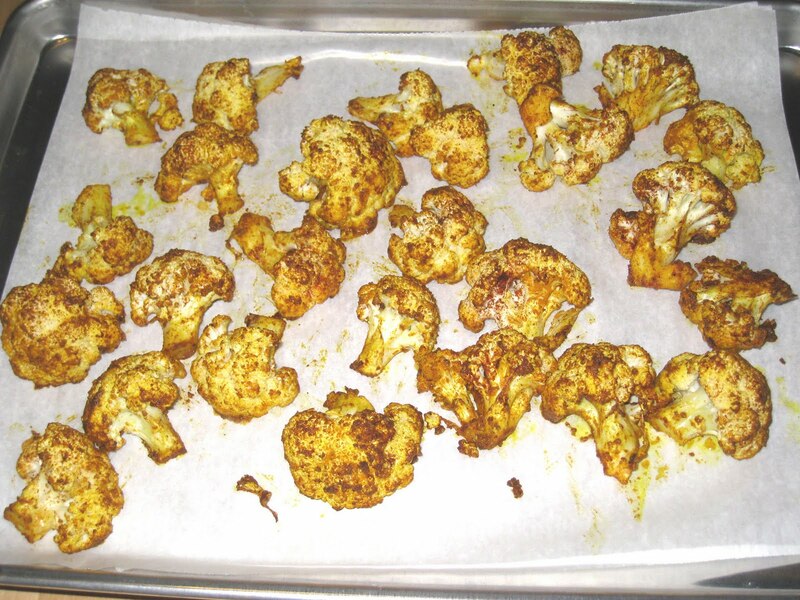 My early roasting methods were to cut the cauliflower into florets and mix them with olive oil, salt, and pepper, then put them on a baking sheet and roast them at 350 deg. F. for 20 or 30 minutes, until they were soft, but not too soft. Whatever makes them seem dry to me also makes them just kind of deflate when they cook too much, so even if they flavor intensifies with longer roasting, that texture issue comes up again for me. As usual, your mileage may vary. I have been watching Aarti Party on Food Network TV. Aarti Sequeira was the Season 6 winner of The Next Food Network Star, and specializes in Indian-themed dishes. The twist is that, in addition to Indian cuisine, she also takes American dishes and adds an Indian twist to them. She is chatty and informative, although she is in danger of getting a little too cute - she seems to be developing what I call "The Rachel Ray effect," where the traits that make a female cooking show host so human and accessible get codified and exaggerated to the level of sheer annoyance, and I can no longer watch them. I hope she can get that under control because so far I really like her recipes and her methods and I am actually learning things from watching her show. 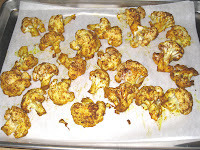 On a recent show, she seasoned her roasted cauliflower with a host of Indian spices. It looked so delicious, and seemed like such a "duh - why didn't I think of that?" moment that I had to go out and get a cauliflower right away. When I made the dish, I didn't use her recipe. I just winged it from what I remembered from the show. Having just now looked at her recipe, I see that I used more spices than she did. Given that some of the reviews mentioned that the spices weren't all that detectable, I suspect mine came out with more flavor. The yogurt-apple-raisin sauce was an accident. I had the yogurt, but I did not have any citrus in the house. I was going to use the mango chutney I used for the Indian Lamb Chops with Curried Cauliflower and Potatoes, but there was a suspicious looking foam on top when I opened it, so I made a mental note to use it more often and had to throw it away. Then I remembered the unsweetened applesauce for my granola that is always around and thought it might add a nice flavor to the yogurt. It did, but I thought it needed just a little sweet so I added some raisins and a bare teaspoon of brown sugar, thinking it was close to jaggery, an unrefined cane sugar used in Indian cuisine. The good news was that it tasted really good on its own so I figured even if it didn't work with the cauliflower it would be quite tasty as a late-night snack. To my surprise, and no small relief, it actually worked with the cauliflower. 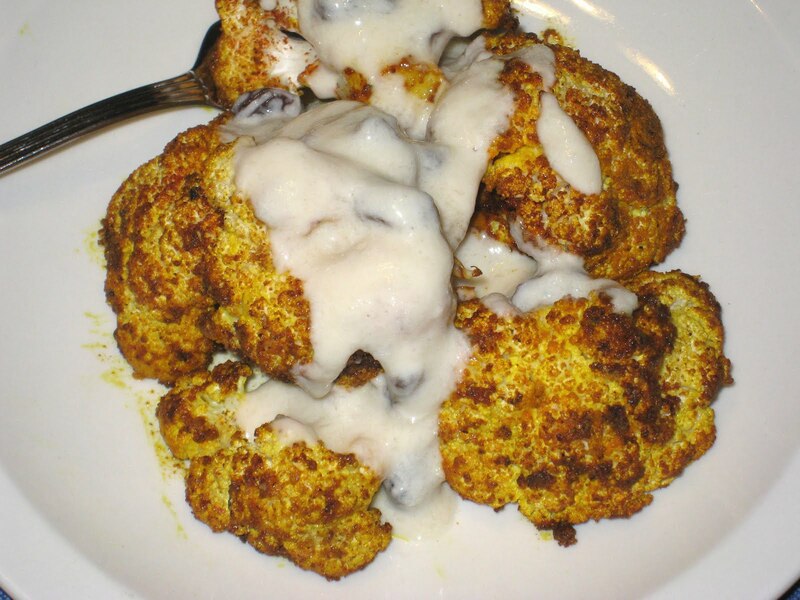 I don't know that I would do it again, and now have a lime in the refrigerator so I can try it with the lime-zested yogurt, but I am quite pleased that I was able to think on my feet, as it were, and come up with a flavor profile that complemented the cauliflower. To me, that is what cooking is all about - finding ways to use what you have to come up with something new, rather than being bound to recipes and stuck if you don't have everything on hand. Would it have been better with the lime or the mango chutney? Possibly. But this worked and I learned something from the process. If you want to try the yogurt sauce, simply add 1/4 to 1/2 cup of unsweetened applesauce, a handful of raisins, and a teaspoon of brown sugar to a cup of plain yogurt and mix well. And if you don't like how it tastes with cauliflower or other vegetables, you can still enjoy it as a fruited yogurt. I was almost disappointed that it did work with the cauliflower; I had started to look forward to a nice bowl of fruity yogurt at the end of the day. I just played it by ear with the amounts and kinds of spices I used. You should feel free to do the same. Combine all ingredients and mix to make sure all of the florets are well coated with the oil and spices. Spread out on a baking dish lined with aluminum foil or parchment paper. Bake in a 350 deg. F. oven for 20 to 30 minutes, until the spices have darkened and the florets are soft. adapted from a recipe by Aarti Sequeira's Food Network.